Plate boundaries are made of lithosphere which is the outer portion of the Earth’s surface, on which humans and all species live. This rigid, brittle layer is ~100 km thick and is made of the Earth’s crust and the uppermost mantle. As shown in the image below, the lithosphere is broken into 12 major tectonic plates which fit together like a puzzle. 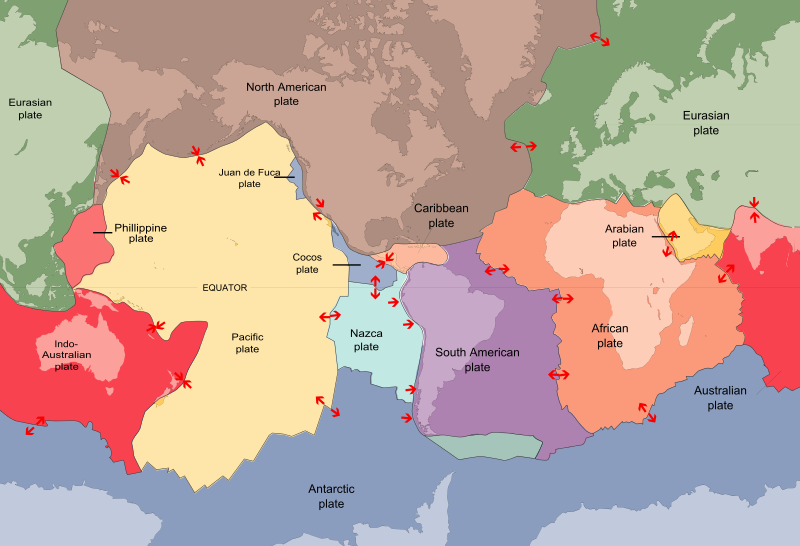 The places where the plates meet are called plate boundaries which can be one of three main types depending on the relative movement of the plates on either side of the plate boundary. 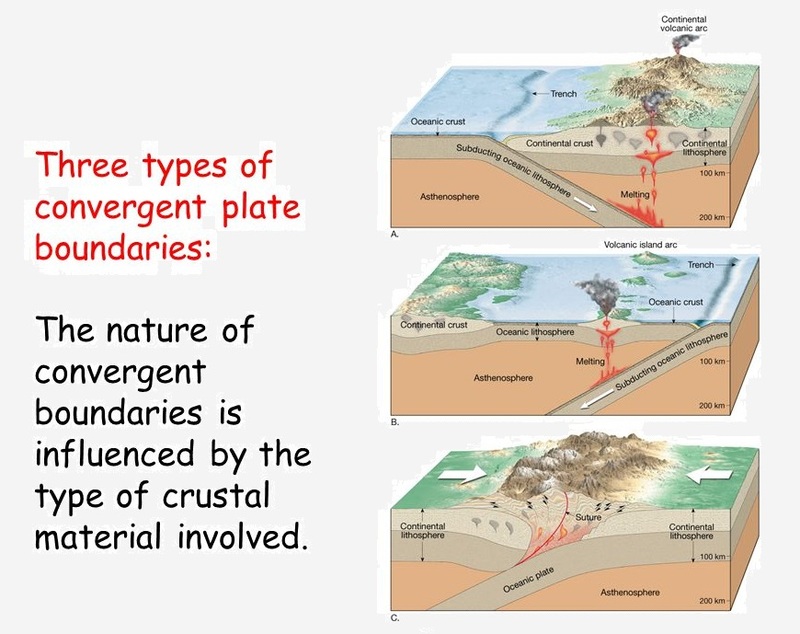 As shown above, if the plates are moving away from each other the boundary is called divergent, if they are moving toward each other it’s a convergent boundary, and if they are sliding past each other horizontally, in parallel but opposite directions, then it’s a transform plate boundary. Most of the Earth’s earthquakes occur along plate boundaries as the brittle plates slide and grind past each other as they move. 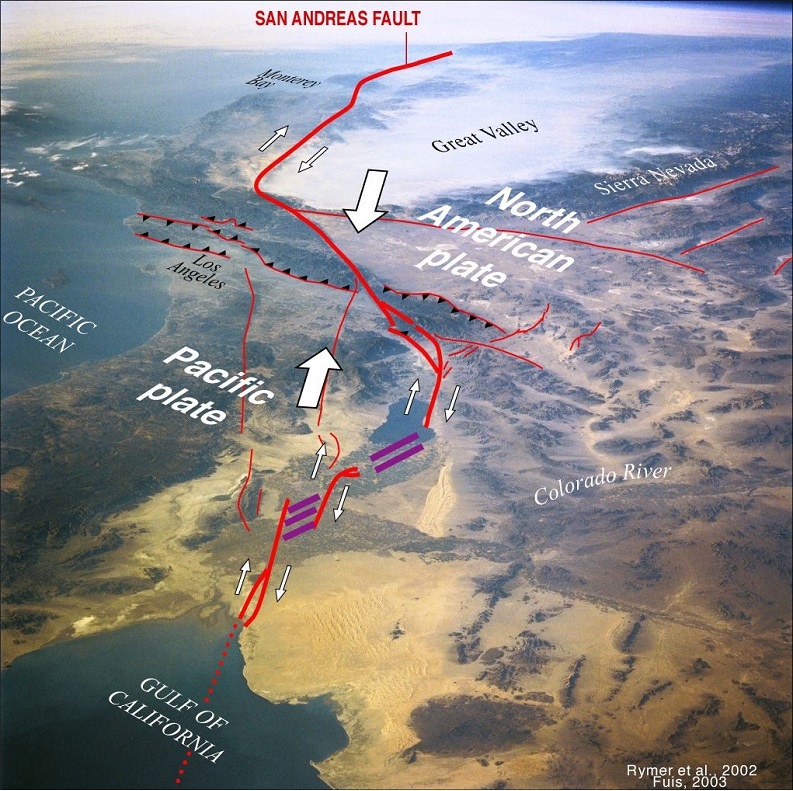 Convergent plate boundaries are home to the deepest and largest earthquakes on the planet. Movement of the plates is driven by heat generated from the radioactive decay of minerals in the earth. This heat fuels convection in the ductile mantle which brings magma toward the surface at divergent plate boundaries and forces plates to subduct at convergent plate boundaries. 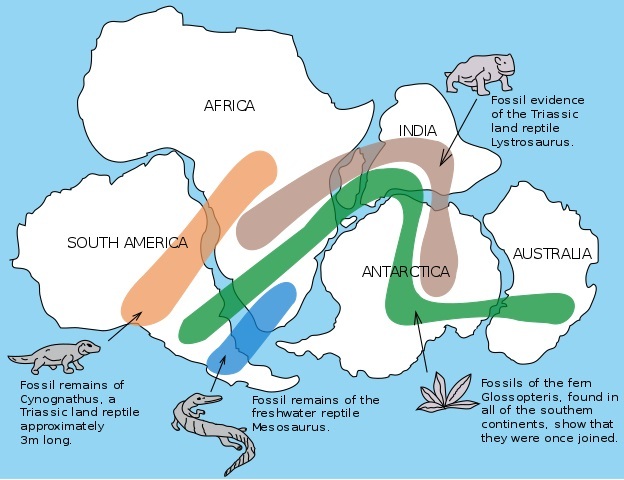 Scientists and explorers began theorizing about plate boundaries and tectonics as early as the 1500’s when they observed that 1) the shape of some continents seemed to fit together like a puzzle and 2) the same plant and animal fossils could be found across these continents, as shown in the image below. These theories were tested and confirmed by scientists and geologists from the early 1900’s to the mid 1960’s including Alfred Wegener’s theory of continental drift, Harry Hess’s seafloor spreading hypothesis and the Frederick John Vine, Drummond Hoyle Matthews and Lawrence W. Morley hypothesis of remnant magnetization. Collectively, and with the help of modern technology, these scientists help set the stage for the theory of plate tectonics and the foundation of geology as we know it today. Convergent plate boundaries can be one of three main types depending on whether the crust on either side is made of thin, dense oceanic crust or thick, buoyant continental crust. 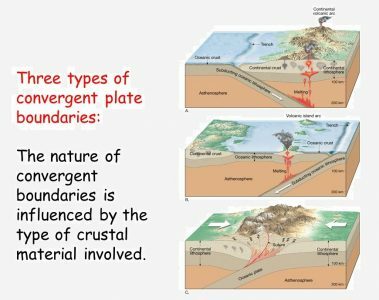 These three types include: ocean-continent, ocean-ocean, or continent-continent convergent plate boundaries. At both ocean-ocean and ocean-continent convergent plate boundaries, the denser, thinner oceanic plate will subduct beneath the thicker more buoyant plate. At ~100 km depth metamorphic reactions in the subducting slab release water into the overlying mantle wedge which lowers the melting point of the surrounding rocks. Like a hot air balloon rising through the sky, this process creates magma which either makes its way to the surface in the form of lava and volcanoes or freezes before it reaches the surface as granitic plutons and batholiths. Because both plates at continent-continent convergent boundaries are made of thick, buoyant continental crust, neither want to subduct. Instead immense collisional forces and large thrust faults form in response uplifting large mountain ranges like the Himalaya. Due to the lack of subduction, few volcanoes are found at continental-continental plate boundaries. Convergent boundaries are home to some of the largest geologic features on the planet including mountain ranges, volcanoes, oceanic trenches and island arcs. Some examples of include the Andes Mountains, the “Ring of Fire”, and the ancient Sierra Nevada batholith. Divergent plate boundaries, also called mid-ocean ridges, oceanic spreading centers or continental rifts, occur where the Earth’s tectonic plates move away from each other. Here, fresh, hot, basaltic magma is brought toward the surface forming new, rigid lithosphere as it cools. As the magma reaches the surface, the plates get pushed apart to make room for the incoming material. Due to the non-uniform rate of magma being brought toward the surface along divergent boundaries, the plates move apart at different rates. To accommodate this, transform boundaries or strike-slip faults, shown in the first few images above, break through the lithosphere allowing pieces of the earth’s lithosphere to slide past each other horizontally at different rates. 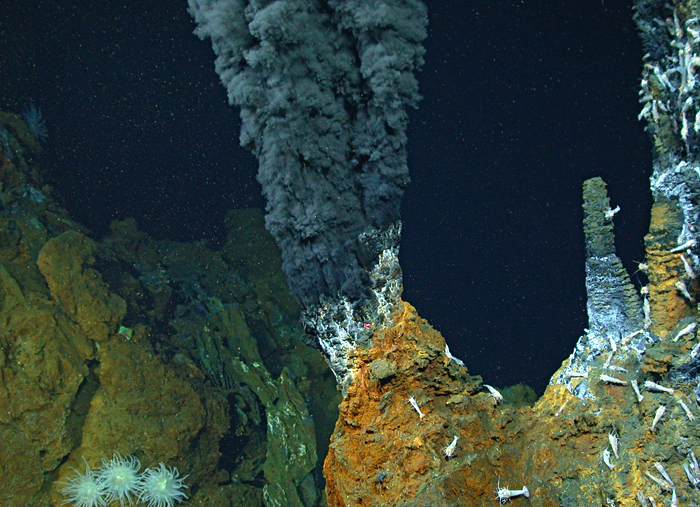 Divergent plate boundaries form unique geological and chemical features like ophiolites and hydrothermal vents (aka black smokers, pictured above) which are home to extreme biological environments. 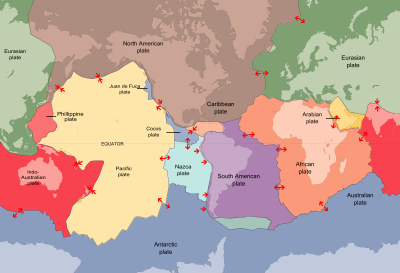 Some examples of divergent plate boundaries include the mid-Atlantic ridge, the east Pacific rise and the east African rift. Transform boundaries occur where the Earth’s tectonic plates slide past each other horizontally along transform or strike-slip faults. These boundaries and can be dextral (right-lateral) or sinistral (left-lateral) depending on which way the plates move. 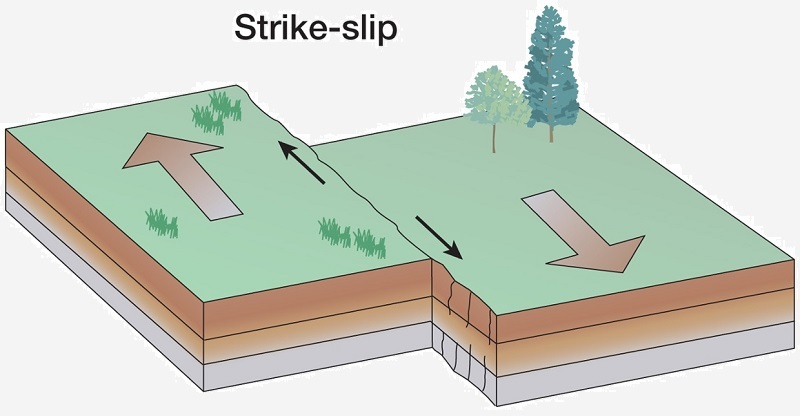 As shown below, a person standing on one side of a right-lateral strike-slip fault will watch a tree on the opposite side move right as the fault slips. Similarly, if the same situation occurred and the fault was left-lateral, the tree would appear to move left. As mentioned above, transform boundaries are common along divergent plate boundaries where they connect sections of oceanic spreading centers or mid-ocean ridges, helping create some of the longest topographic features on the planet. Transform boundaries are also found on larger scales on land like the Alpine fault in New Zealand and the San Andreas fault in Western North America pictured below. Mountains, basins and unique topography can form along transform boundaries depending on the fault’s geometry, the rock type and how parallel the motion of the plates are to the strike of the fault. In particular, bends along strike-slip faults can form both basins and mountains like those shown in the image above. 1. What type of plate boundary produces new lithosphere? 2. What drives plate tectonics? 3. Which of the following is an example of a transform plate boundary?